"On February 12, 1809, Abraham Lincoln was born in a one-room log cabin on Sinking Spring Farm, which is located on Nolin Creek about three miles south of Hodgenville, Kentucky. He was the second child of Thomas and Nancy Hanks Lincoln. His sister Sarah was 2 years old when Abraham was born." "Abraham Lincoln was elected the 16th president of the United States on November 6, 1860 and served from March 4, 1861 until his assignation on April 15, 1865. Language that invites participation. The three most powerful words a leader can speak are: “you,” “we” and “us.” These words connect, bringing others into the fold and involving them in your message. Passion for your subject. When you speak, are you listless, disengaged or even boring? If you lack passion and enthusiasm for your message, your audience will notice. Dig deep and get passionately behind the message you want to convey so others can sense and adopt that energy." 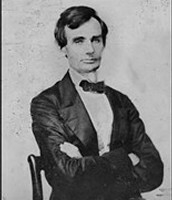 "In his younger years, Abraham Lincoln spent much of his time doing chores and farm work. He became known for his brawn and competitive nature and enjoyed an occasional wrestling match." 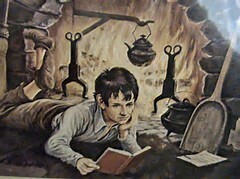 "He was a very thoughtful boy who read anything and everything he could get his hands on. He was also very hardworking. He loved his stepmother Sarah Bush Lincoln and his older sister Sarah. His relationship with his father has been disputed, but many historians believe it was not close. Abraham was a good boy. His stepmother related to William Herndon after her stepson's death that he was "the best boy" she ever saw." "Abraham Lincoln was a very tall man with four kids. he lived in the white house when he was president. he was named after his grandfather who got shot by an Indian while he was cleaning a field. Abraham lincln got shot in 1865 by a man in the textures." "Lincoln liked animals a lot. Once he was at a park with his friends after a bad windstorm, and he found two baby birds. Lincoln looked all around the park to find their nest and he found it. His friends laughed at him when he came back, but he just said "I could not have slept tonight if I had not given those two little birds to their mother". When his friends hurt animals as a joke, he immediately stopped them. When he grew up, he once found a stray dog. His kids loved it and they kept it - until the owner wanted it back. Lincoln and the owner decided that the owner would give Lincoln a puppy if he gave the dog back. Before the trade was made, the dog ran away and they never made the trade. Later on, they got another dog (they owned this one) named Fido. This dog was stabbed to death by a drunken man when the Lincolns were on vacation. Lincoln loved kittens, and so did his son. When the family was eating dinner once, he fed a kitten. His wife (who didn't like animals) got mad at him, but he continued to feed the cat. He bought two goats for his children, and they were allowed to roam free in the white house. The cleaners got mad at Lincoln because they made a mess, but he defended the goats. One time, he found peacocks with a very old and broken perch. He fixed it up so that they could be comfy. There was once a fire at the White House stable. Lincoln almost jumped in the fire, just to save the horses. He opened the doors, but some friends caught him and stopped him just in time." 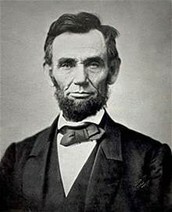 "Abraham Lincoln was the 16th President of the United States, serving from March 1861 until his assassination in April 1865. Lincoln led the United States through its Civil War—its bloodiest war and its greatest moral, constitutional, and political crisis. In doing so, he preserved the Union, abolished slavery, strengthened the federal government, and modernized the economy." 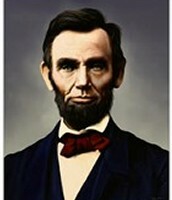 Abe Lincoln, He most helpful and nice leader we had and he was the best leader we had. 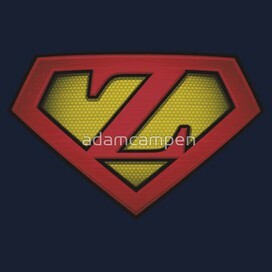 "Abraham spent his formative years, from the age of seven to twenty-one, on the family farm in southern Indiana. As was common on the frontier, Lincoln received a meager formal education, the aggregate of which may have been less than twelve months."